As of 4:30 p.m. today, water levels in the DeKorte Shorebird Pool have dropped dramatically in advance of a routine inspection of the piling-restoration work done under the Visitors Center in the Meadowlands Environment Center. A quick look found no unusual birds of interest. The Marsh Discovery Trail will be open at noon on Tuesday and Thursday for the the weekly 90-minute walks. Contact Jim Wright here if you want to rsvp for a walk. Researchers from the Smithsonian have been visiting a marsh along the Hackensack River in Carlstadt to study Swamp Sparrows, with an assist from the New Jersey Meadowlands Commission. There are two types of Swamp Sparrows in the Northeast. One frequents uplands, the other likes coastal plains. The Carlstadt marsh is one of the few places where both species occur and adapt, over time, to thrive in the salt marsh. Researchers are banding and cataloging the Swamp Sparrows, and looking into how they evolve for their environment. More on Coastal Plain Swamp Sparrows here, with a link to Coast Plain Swamp Sparrow Facebook Page. Photo of banded Coastal Plain Swamp Sparrow follows. 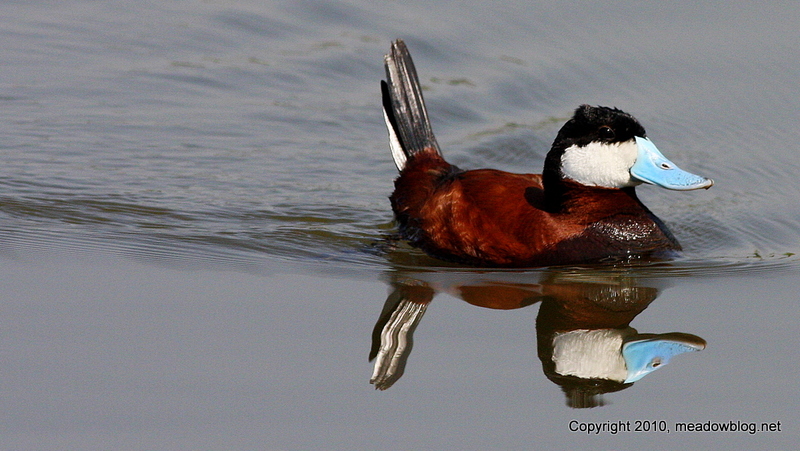 Now That’s a Ruddy Duck! Seen regularly on our free Marsh Discovery walks at DeKorte Park, at noon on Tuesdays and Thursdays. Call Jim Wright at 201-460-2002 for more information.